I have heard many debates about this topic since high school. Many people think phones are distraction for us. My history teacher is one of them. She hates phones so much that she would fail the student if she found he or she use phone in class. On the other hand, some people claims that phones are necessity in our daily life. Every morning my mom would remind to bring my phone.She thinks that it is really important to have phone with me when I go out.If something goes wrong, I can call her immediately. Personally, I do not think phones would be a serious problem for students. Thus I do some research. I found a experiment in a website called The Conversation. In the experiment, researchers did a survey in 4 cities in England(Birmingham, London, Leicester and Manchester) since 2001. At that year, 90.3% of UK teenager have phone. Researchers took notes about the students academic achievement from their national exams. “After schools banned mobile phones, test scores of students aged 16 increased by 6.4% of a standard deviation, which means that it added the equivalent of five days to the school year”(The conversation). From the data, it’s very obvious that without phones, students pay more attention in class. If students have phone with them, they might take a look at their Facebook or instagram, play games or text their friends. They do not have distraction anymore after the school ban the phones. Thus students pay more attention in class, and they have a better academic performance. However, I do not think phone is the major distraction in class. 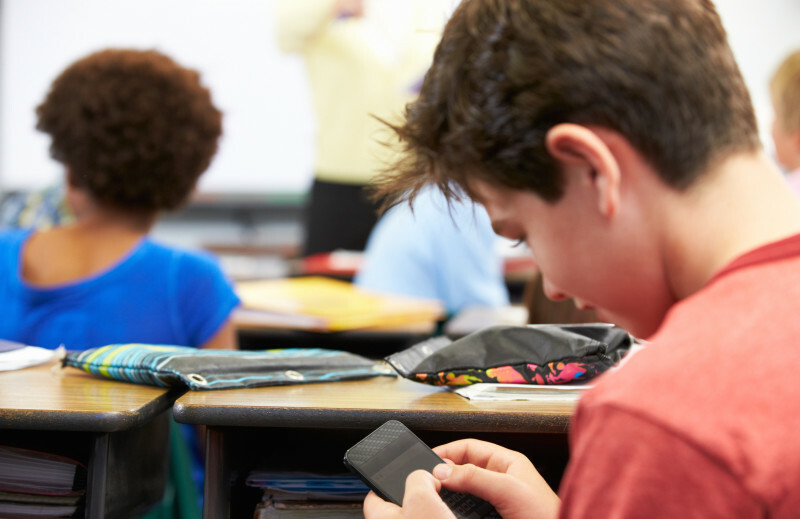 If a student do not want to pay attention to class, even though they do not have their phones with them, there would be other distractions for them. They might talk to their friends, draw something in their notes or even sleep. If they want to study hard, there would be no distraction for them. In addition, phone is the only tool for us to communicate with others. Now in America, there are many tragedies happen in school. Everything can happen. If something goes wrong, we can contact to others immediately if we have phone. If we do not have phone with us, we might miss something important or even be in danger. Thus I think it is necessary for us to have phone. I agree with the idea that phones are distraction for class, but I also agree that it is necessary for us to bring phone with us. After my consideration, I think Andrew’s experiment is very helpful for this question. Students should give their phones to professor, and they can get their phones back after class. In this way, students can not only pay more attention in class, but also communicate with others if necessary. If all the schools can do this, I think we can solve this problem easily. This entry was posted in Uncategorized on October 20, 2016 by Linghao Yang. I like the idea of being able to use or cellphones in class, if they can somehow be used correctly. Just me personally if I was allowed to use my phone in class for things I feel like I would get distracted really easily and would want to text and snapchat and go on social media and things like that. If I could keep myself away from that stuff I think phones can be beneficial to class and can enhance the learning experience. The way Andrew has been saying about trying to come up with ways to stop cell phone use in class got me thinking. What about the “adapt or die” mentality in nature? Wild animals have to adapt to their surroundings or die, right? Why is it that teachers are trying to adapt cell phones to the learning environment? Technology is always changing. Why shouldn’t teaching adapt to cell phones. I like the way Andrew uses the comment wall and texting polls as a way to incorporate them and I just think that maybe instead of trying to find a way to keep them out, teachers should find more ways to utilize them. Your thoughts?